Here is a guide to painting metal figures. Our block and dowel system. 1. Preparing. Always check the figures for ‘flash’ (excess metal) and remove it with a file or other tools. Make sure the base is flat and that the figures will stand up. Once you are happy with them wash them in warm water with washing up liquid; rinse in clean water and dry them off. When they are dry you are ready to begin. 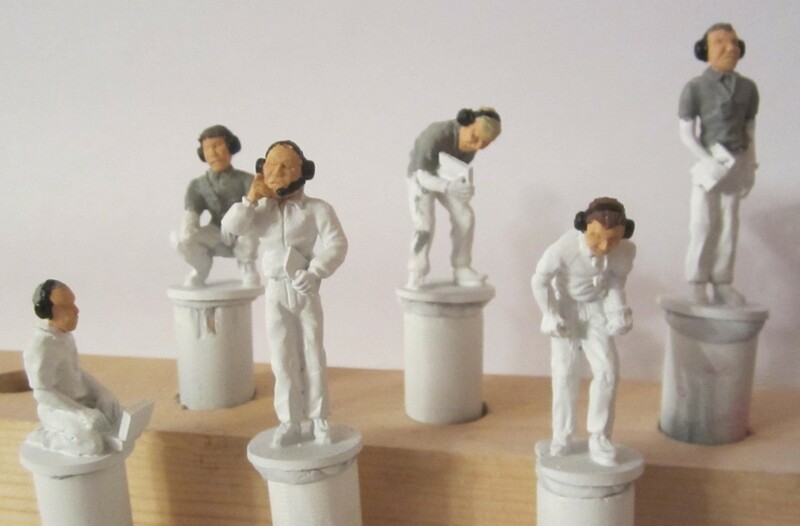 We have found it hugely helpful to create a block and dowel system for locating the figures while painting them. We found some dowel and some 2″ x 2″ timber (50mm x 50mm), cut that and the dowels to suitable lengths (the dowels need to stick up out of the block enough to get hold of them below the figures) and then drilled holes (slightly larger than the dowels) in the 2×2 to take the dowels. 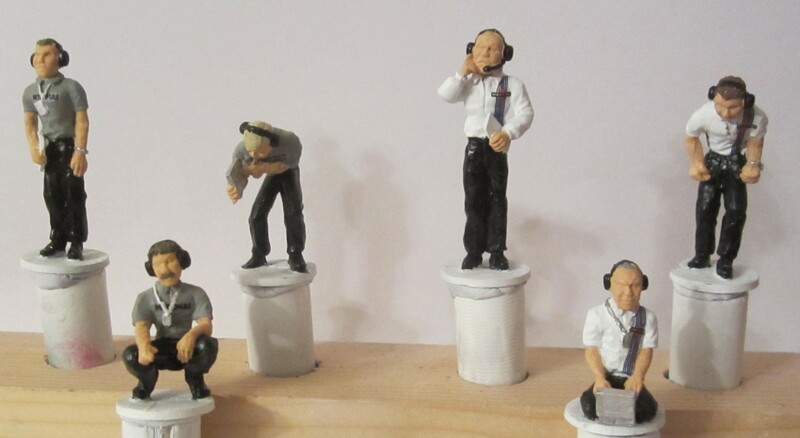 These make a great way to mount the figures so you don’t have to touch them while painting. A lump of Blu tak or something similar will hold them in place. Figures primed and ready for painting. 2. Priming. We use a matt white, multi-surface spray primer. The one we use is from Rust-Oleum and we get it from the local Homebase. 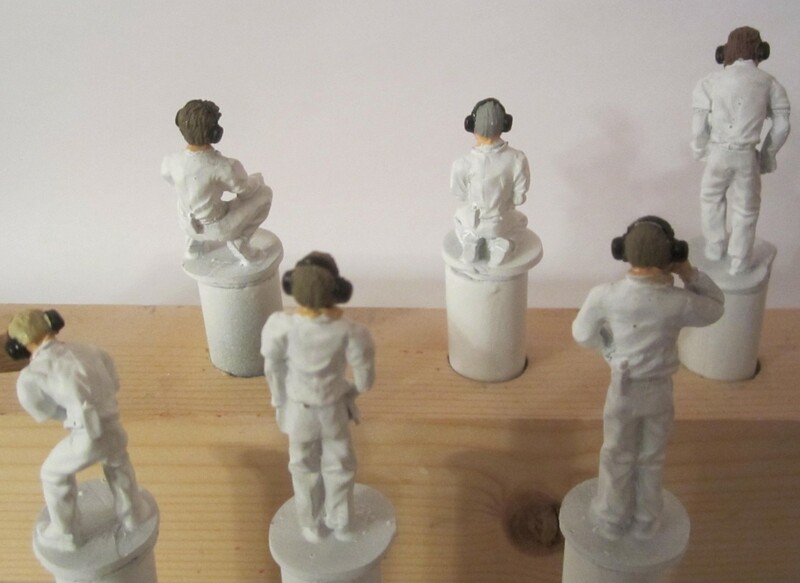 We spray the figures in the block as we can angle them up and down or turn them round to cover all of each figure. Follow the instructions on the can but we find that several light coats are far better than trying to do it all in one go. Leave to dry after each coat. It is quite quick. 3. Beginning the colours. We always begin with the face and especially the neck – mostly using Humbrol 61. It is important to get right into the V of the short collar and around the neck or collar. (We don’t always worry about the rest of the flesh until later.) Broadly we work down from the top. So, maybe surprisingly we do head phones and head sets if they have them before we do the hair (usually we use Humbrol 85 satin black). This may seem strange but in fact it is easier to paint up to the edge of a head set than to paint one on after painting the hair. When the black is dry we do the hair. For hair we user a variety of colours (Humbrol numbers 64, 70, 71, 110, 186) being careful where the hair meets the flesh or the headset. 4. Working your way down. 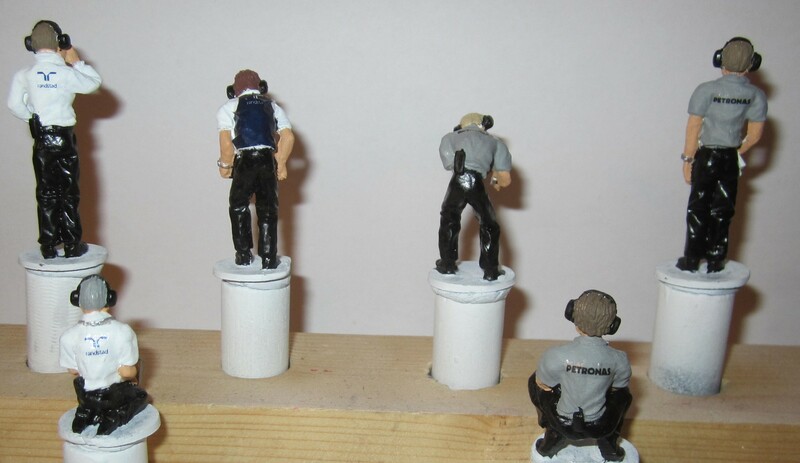 Next we go for the torsos, painting shirts or overalls. Sometimes they need to be in a particular team colour and sometimes they can be whatever colour you choose. Either way it is important to go very carefully around the collar so as not to splash any on the flesh of the neck. In the picture we were doing some technicians in Mercedes and Williams colours. 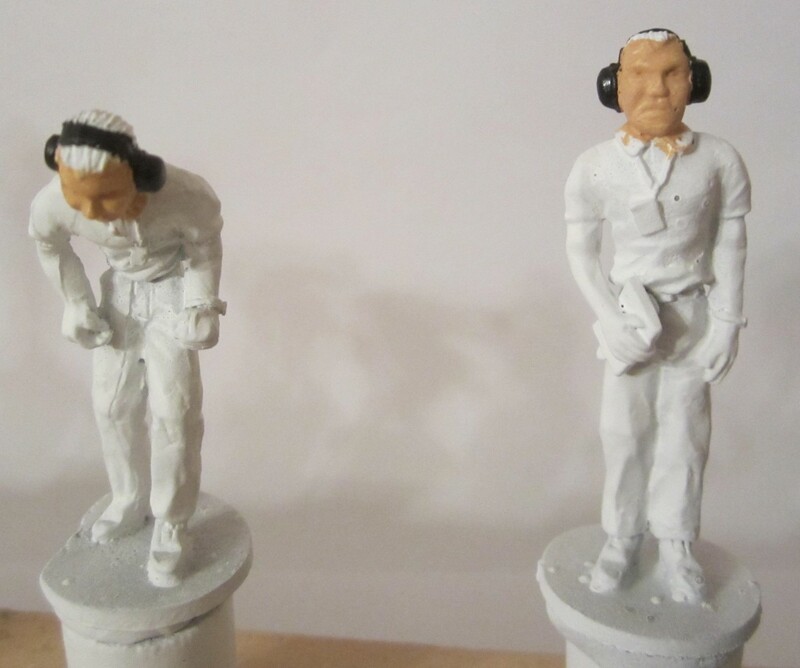 Although the Williams ones needed white shirts and the primer was white, I gave them a coat of Humbrol 34 Matt white partly to cover up flesh on the collar but partly because the primer is not really a suitable top coat. You may find that one coat doesn’t entirely cover it. 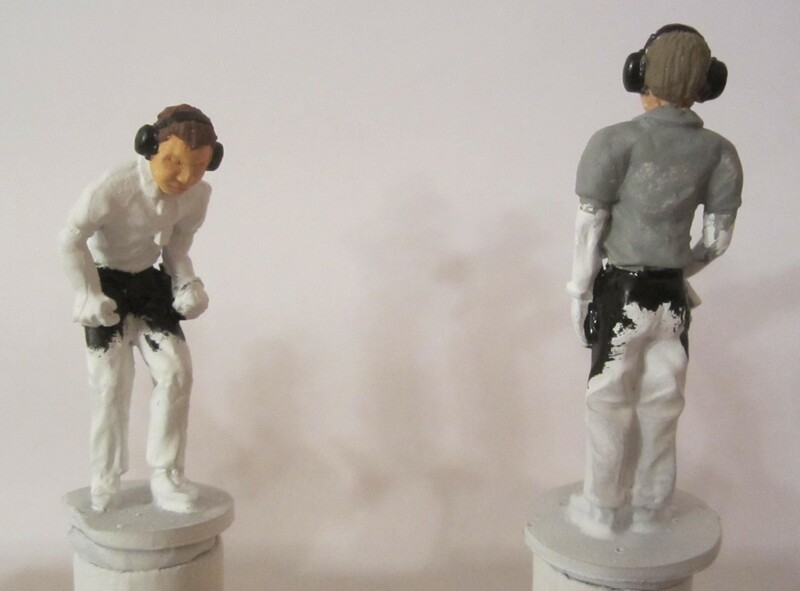 (Sometimes there are little air holes in the casting which the paint struggles to fill.) Don’t worry it is likely you will be coming back to tidy up this paintwork after adding some more details. Small brush for making a band against another colour. Big brush to finish the job more quickly and look after the little brush. Shirt tidied up after with grey paint and watch added. 5. Arms and Details. Once that is all dry you can go back and do the rest of the flesh on the arms plus some details, like security passes, watches, etc. Doing the arms you just need to avoid touching it on the shirts. While you have the flesh out it is worth seeing if you missed anything on the faces or got some hair on it. Once you are happy with this you can move on to the details. You really need a detail brush in good condition for these. For security passes, unless they are going over white shirts or dresses, I would always use matt white (34) for the pass itself and the strap. Do it as neatly as you can but be prepared to get some on the shirt rather than leave an unpainted part. (As with the head sets earlier it is easier to paint up to an edge then to paint one on.) When the shirt is white we use silver for the passes and often also for watches. Again with the watches it is difficult not to get some on the arm but again it is relatively easy to take the small brush afterwards and paint up to the band of the watch. Team logos added at the front . . .
. . . and the back! 7. Decals and varnish. With some figures you might want to add some team or company decals. We can provide a selection of these. Use the ‘Contact Us’ tab to enquire about availability and price. Here we added some appropriate ones for each of the two crews. The decals usually come with instructions but it is worth noting that sometimes they need to go across badges or there are arms that get in the way. If it is something like a cord round a badge you can either apply the decal across it and then paint over the cord again. Or you can cut the decal (before it goes in the water!) remove a bit roughly the size of the cord or other object and then stick the two parts on either side of it. You can do something similar with arms that get in the way of front decals. Just cut the decal roughly to the right shape before getting it wet and then apply in the correct position. Again a very valuable tip is to order some Microsol which helps to soften the decal and help it to go into the contours of the figure. Once you are happy with the paint and decals it is time to varnish the figures to remove the rather unrealistic look of some of the gloss or satin paints. We use Humbrol Matt Enamel spray varnish. This is good for going on enamel or acrylic paint, whereas the Acrylic varnish is fine on acrylic but will give a crazed appearance if it goes on enamels!! 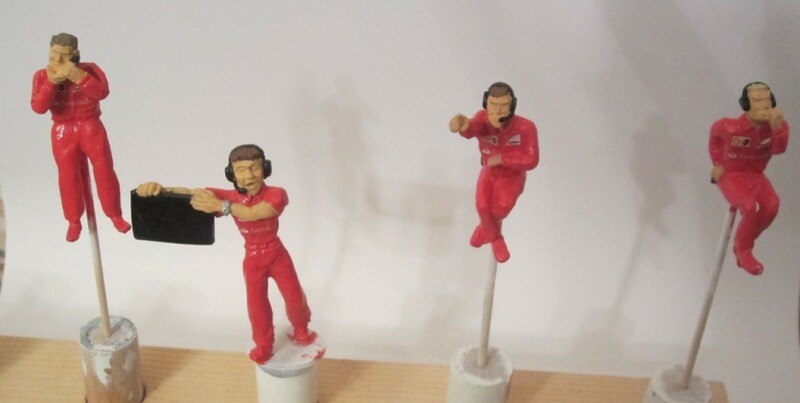 If you think your figures are going to get a lot of handling or knocking over you might even want to spray them with gloss varnish first and the with the matt as the gloss gives them a harder coating and then the matt takes the sheen off. 8. And finally . 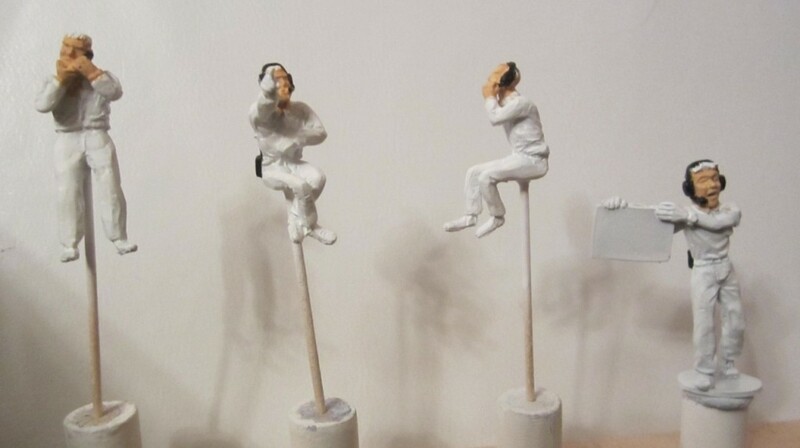 . . What about those awkward figures without bases to stick on to the dowels? You can’t hold them an paint them all over at the same time. Standing figures are not too difficult in that you can actually stick them on to a plastic card base and remove it later (or not as you wish) but for seated or squatting figures this is impossible. So we borrowed a solution from the miniature war-gaming painters. Get hold of some cocktail sticks, Cut the pointy bits off both ends and discard them. Then, with a cocktail stick sized drill bit, drill holes in the top of the dowels. Next take a seated figure and turn it upside down on the edge of a work bench – or better still between the jaws of a vice or work-mate type bench (Don’t tighten it so much you damage the figure!). Then drill a small hole in the bottom of the figure. It doesn’t need to be more than 2 or 3mm deep. Push a cocktail stick into this. If the drill bit is the right size you probably won’t need to glue it in. (If you need to you can but you will then have to cut the stick off afterwards and that can damage some of your painting.) Then pace the other end of the sticks into the dowels and carry on as before. 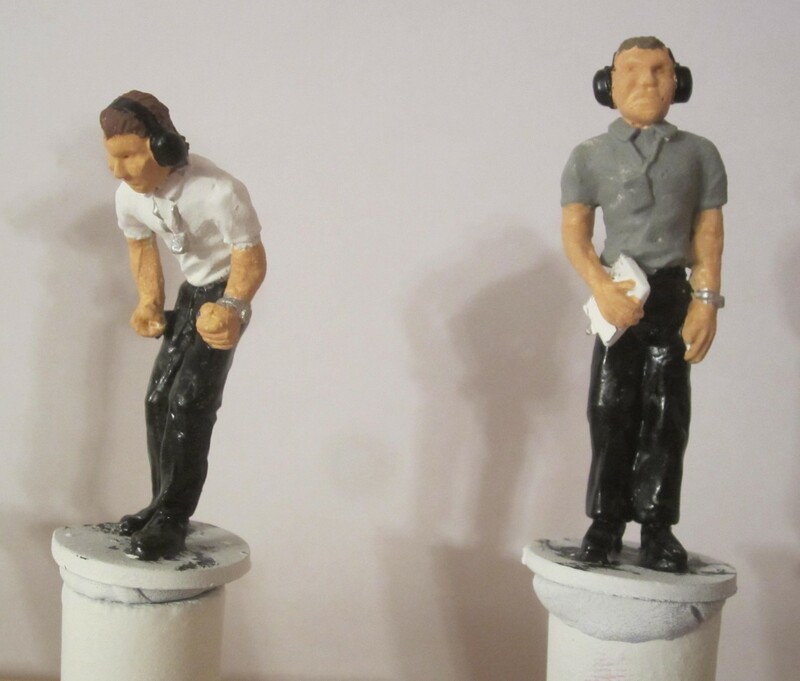 We paint the figures right up to the decal and varnish stage before removing the sticks. It is then relatively easy to put a little filler in the holes and to paint over it. Figures just before removing sticks. Just one or two more things to add. We use both acrylics and enamels. Acrylics are in some ways easier to work with (no smell and you can wash your brushes in water) but not all the colour range is available as acrylics. Also if you have trouble seeing the detail get one of those magnifying glasses on a stand or perhaps better still one of those headsets with a range of magnifying lenses. These sometimes have lights built in but I don’t find them bright enough for me and the batteries keep running down so again a good mains powered lamp on a stand to be by where you are painting is really helpful. So have fun with your painting. It does take time but you will get quicker and better with practice. It can be very satisfying and it means you can have the colour schemes of your choice. If you have any questions not answered here please use the Contact Us form to ask.